vendhaya mor kuzhambu recipe - a comforting, delicious, traditional south-indian curry recipe made with fenugreeks seeds and curd. add 2 teaspoons of oil to a pan. 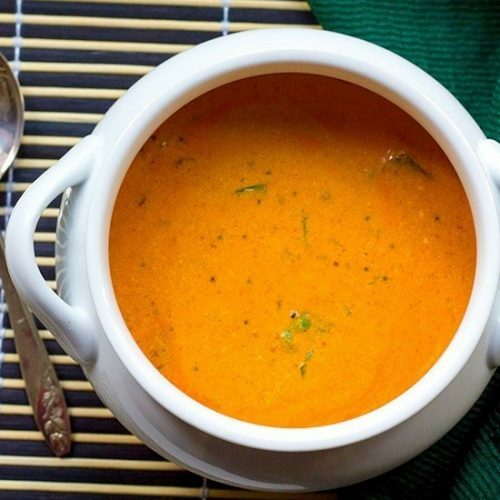 roast 1¼ teaspoon urad dal, 1¼ teaspoon methi or fenugreek seeds,1½ tablespoon tuvar dal, 1 teaspoon coriander seeds, asafoetida, 4 to 6 dry red chilies, at medium heat for 2 to 3 minutes . allow this to cool. transfer the roasted spices to a mixer/grinder. grind it to a smooth paste adding 3 tablespoons of fresh grated coconut and small amounts of water at a time. i used about ½ cup of water. transfer the prepared paste to a separate bowl, add 2 cups of beaten yogurt/buttermilk and ⅔cup of water, ¼ teaspoon turmeric powder, salt to taste. whisk this to form a uniform mixture. chop the green bell pepper/capsicum to bite sized small pieces. in a thick bottomed wide pan, heat 2 teaspoon of oil. to this add mustard seeds, cumin seeds, 1 dry red chili and finely chopped 1 green chili. once they splutter, add the chopped green bell peppers. stir fry at medium-high heat for the first 1 to 2 minutes until they develop some browning. then simmer, cover and cook giving a stir now and again until it softens. once the capsicum is cooked, reduce the heat to low, pour in the prepared spice and yogurt mixture. mix everything and cook at low heat. give it a stir now and again. it is important that the mixture is allowed to cook at low heat, otherwise,the curd/yogurt will split. please be patient and once the mixture comes to a first boil, turn off the heat. serve with steaming hot rice and a teaspoon of ghee if desired. a variety of other vegetables can be used instead such as white pumpkin, okra/ladies finger, aubergine/brinjal, green peas. if using white pumpkin, once you prepare the tempering for the final dish, add cubed white pumpkin, stir. add sufficient water to cover the gourd, simmer until it cooks through, then add the rest of the ingredients. if using okra or aubergine, stir fry them similar to green bell peppers as in the recipe below and follow the rest of the recipe in the same manner. please remember to cook the kuzhambu at low heat to avoid splitting of the curd/yogurt. adjust spicing to suit your taste. for an added level of flavor and spice, add 1 finely chopped green chili to the tempering.